Vertical storage, in general, is always one of the best options when there is a concern for the footprint size of buildings, shelves, and product storage, et cetera. We see the concept of vertical storage used in the city with the use and building of vertical apartment buildings and in hopefully most industrial warehouses, and store backrooms and storage areas. 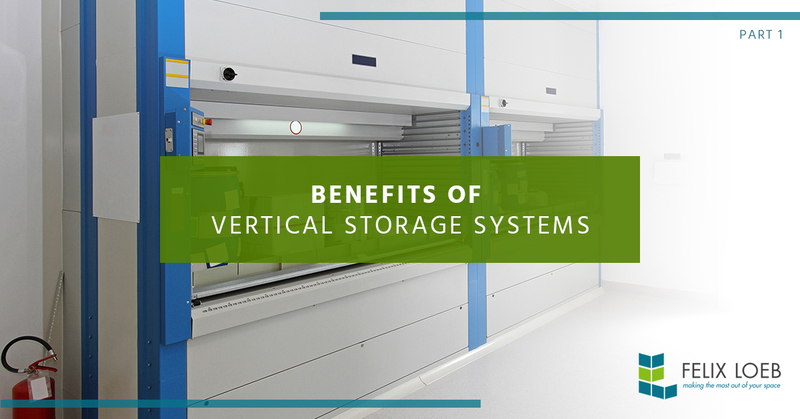 Today, we are going to lay out the benefits of vertical storage systems and how Felix Loeb can help your Chicago business thrive. As we’ve already indicated, vertical storage is the best way to use the space that you have. Vertical shelving allows you to effectively store items that are easily accessible and organize your inventory, which can cut down on loss, allow you to better use your work area, and perhaps give you the ability to carry more inventory on location. There are many types of storage systems, though some of the most effective are wire rack industrial shelving. Efficiency is always equated with success because it allows you to more fully focus on your business and what it provides instead of, for example, using time looking for items. Vertical storage allows you to better see where all of your products or tools are located and works in tandem with many other organizational methods. Stay tuned for our next blog post to learn more about the benefits of vertical storage for your Chicago business. Felix Loeb is proud to serve businesses in the Chicagoland area with state-of-the-art storage solutions. Our goal is to, in essence, partner with you for the success of your business. Learn more about our products and services on our website. Interested in our vertical storage solutions? Contact us for a free project quote!